Madge gives Darryl Cotton back his key for Room 242. He asks if he can do anything for her in return. Madge says actually, there is something! 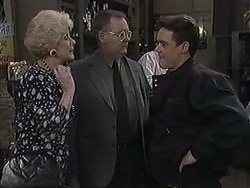 Beverly arrives home to find Jim blowing up his bike tyres. She pinches his bum! Harold comes up looking for Madge as Jim heads off on his bike. Beverly suggests that Harold could take up cycling too, but he hasn't got a bike. Beverly says he can borrow Julie's bike to try it out. Des is looking for chocolate biscuits and Matt tells him to give up and go and give Jamie a bath - he's trying to make dinner. Apparently Melanie is out babysitting for Roger's kids. 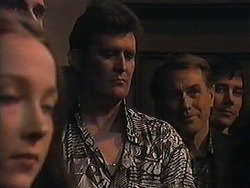 They chat about Roger and agree that neither of them think Roger is right for Melanie. 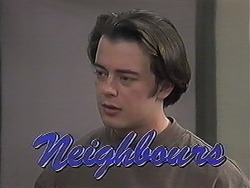 Matt gets the impression that Roger is using Melanie, but Des warns him to stay out of it. Josh pops round looking dejected. He tells Josh that Melissa has entered his song in an inter- school poetry competition - if it wins, Josh will be famous for something he hasn't even done! Eddie has cooked dinner for Harold and Gemma. Madge comes in from work and Harold wants to know where she's been all day. He's rather frosty with her and Madge tells him she's actually done quite well today. Harold says he knows Madge went to see Darryl in his room - Melanie told him. Madge says she's made Darryl an offer he couldn't refuse! 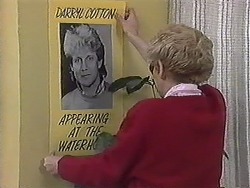 Madge is putting up posters advertising Darryl Cotton, who is to appear at the Waterhole! Yay! Melissa and Josh come in - Josh has won first prize in the poetry competition! Matt and Gemma congratulate him. At the counter, Matt tells Josh that everything's fine, he doesn't mind Josh taking the credit! Harold is still sulking with Madge over Darryl Cotton. Darryl Cotton is just finishing his act, and his last song is dedicated to Madge! Apparently he's been writing it over the last few days. It's not a bad song, but Harold is less than impressed at the lyrics which are all about love for someone he's just met(!) 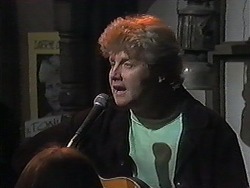 As he sings about "opening your eyes to love", we see shots of various neighbours (Jim, Caroline, Des) looking thoughtful. At the end, everyone claps. 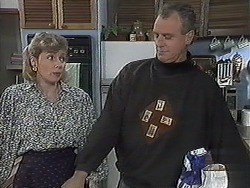 Paul tells Madge that he's impressed with her efforts, but Harold just walks off. Harold is off to try out Julie's bike. Madge and Gemma chat about Gemma's relationship with Matt. Gemma says that Matt is very intense and he seems to be breathing down her neck all the time. Madge is worried that Matt might have "more mature" expectations of her - and Gemma's got enough on her plate as it is. Harold and Jim are both heading off for a bike ride. Jim teases him that he needs to keep fit because now he has love competition from Darryl Cotton! They head off and Harold looks very wobbly indeed! Doug drives up and laughs with Des about Harold's style on his bike! Melissa is raving about Josh winning $100 and wants to know what he's going to spend it on. Matt comes up and Josh suggests that he buys the same music records that Matt likes, so Matt can borrow them. Matt jokes that he likes Ukrainian folk music and church choir stuff! Paul asks when Melanie will be leaving her job. He's sad to leave her, and still doesn't see why she has to give up work due to getting married. Caroline (who is inadvertantly dressed as a character from Star Trek today!) says that Roger wants Melanie to be available for his son, Michael. 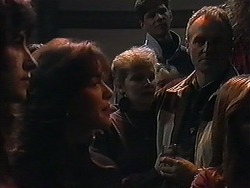 Caroline suggests Prue as a replacement for Melanie. Madge comes in and Paul tells her that the takings for the Waterhole are up 30%. He wants Madge to wangle other performers on a regular basis. Madge doesn't think she is up to the job, but Caroline tells her they want her to oversee all the entertainment from now on! Harold is working out on some machines and looks absolutely knackered. Jim, meanwhile, is going quite well on the rowing machine - he is hardly breaking a sweat. Jim tells Harold not to overdo things, but he insists that he's fine! Harold is on a bike machine. Doug comes in and warns Jim not to strain himself. Doug is on a bike machine now, chatting to Jim, while Harold is absolutely knackered on a machine in the foreground. Doug boasts about being very fit. Harold, meanwhile, has trapped himself on a leg-stretch machine! 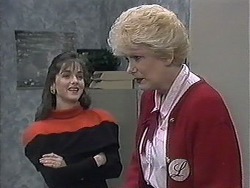 Madge is shocked to hear that Harold is at the gym and thinks he must have flipped out! Apparently the takings are up in the Coffee Shop too, but Eddie can't show her the books because Harold made him promise not too. Melissa is still banging on about Josh winning the poetry competition. She goes to the counter to get him a milkshake while Josh confesses all to Gemma at a table. Gemma is surprised to hear that Matt could be so sensitive. She realises that Matt must have been talking about her in the poem. Beverly is laughing about Jim being paranoid about Doug's fitness levels. She thinks Jim is being a little over- sensitive where Doug is concerned. Matt tells Josh firmly that he doesn't want the poetry prize and advises him not to tell Melissa - she's happy, so why spoil it?! As Josh is leaving, Gemma arrives. She congratulates Matt on his "award- winning poem" and looks at him shyly. Matt says he really does feel that way about her. Gemma says she likes him a lot, but things are moving too fast for her. She wants to cool it - in fact, she wants them to stop seeing each other altogether. Matt looks gutted.